Holobunnies - Hologram Bunnies Space Adventures is an unwieldy but descriptive name for this title from q-bit games. 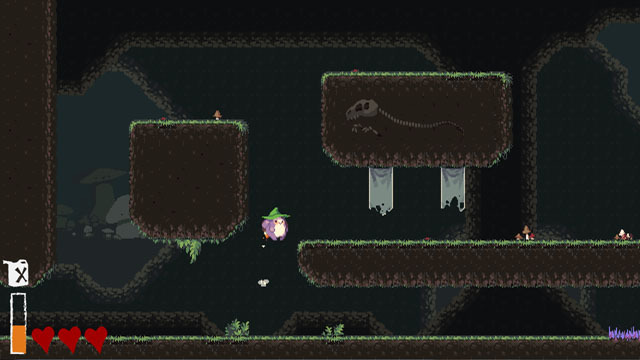 The game is an action-adventure platformer where the player takes on the role of one of several holographic bunny siblings: Danielle the witch, Leenox the hunter, Roméo the bard, Mephisto the ninja, or Avril the catcher, each of which comes equipped with a projectile weapon and a jetpack. The bunnies' ultimate goal is to find a new planet to inhabit as they freely cruise through space in their ship. Tracking down a new home requires tangling with the local residents of various stellar bodies, speaking with NPC's, and collecting treasures that include starship upgrades, new items, and pieces of a mysterious door. Bunny buddies can also team up for some local 2P co-op. The game is coming to PC, Mac, and Linux via Steam in 2016. You can try the PC-exclusive demo from the game's Kickstarter page.